All members receive a Daily Sentiment Report and ad hoc reports if there is anything especially timely or unusual. 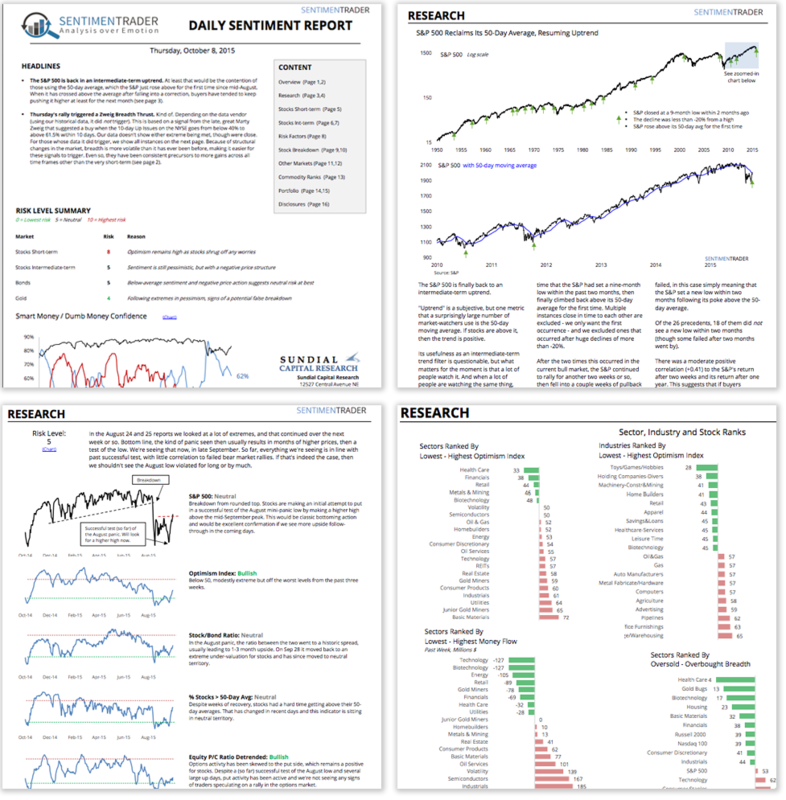 The Daily Sentiment Report includes an overview of where short- and intermediate-term sentiment is each day, along with updates on indicator extremes or studies focused primarily on sentiment, breadth and price action. The reports also include an overview of sector sentiment, ranks of the most- and least-optimistic sentiment for industries and individual stocks, as well as currencies, commodities and bonds. The reports focus on meaningful extremes within markets, as well as themes that are growing in popularity in the media. Often, the statistical or practical conclusions don't necessarily agree with what has been reported elsewhere. Sometimes, it's just as useful to know what doesn't work as what does. We do not provide investment advice. Our goal is always to find some practical angle, but what you do with the research is up to you. By no means is it ever suggested that you make a trade or investment based on a single reference; we consider our research to be only one part of what should be a comprehensive investment philosophy that includes fundamental and technical data.